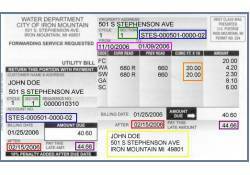 The City of Iron Mountain Utility Billing Department sends out monthly (Business) and bi-monthly billings for water, sewage, and garbage charges all located on a single post card type mailer. Each charge on the bill is identified with a code. The first is a flat charge referred to as the availability charge (FC & SC) which reflects the utility’s cost to keep services available even if none is being used. This fixed fee is based upon your meter size. The garbage charge (GA) is also an availability charge which reflects the utility’s cost to keep services available even if none is being used. The garbage charge is a flat $4.55 per month. The second part is referred to as the commodity charge (WA & SW) based upon the metered amount of water used. Sewage usage is charged based on the amount of water used. Water rates are per 1,000 cubic feet (7480.52 gallons) of water used.